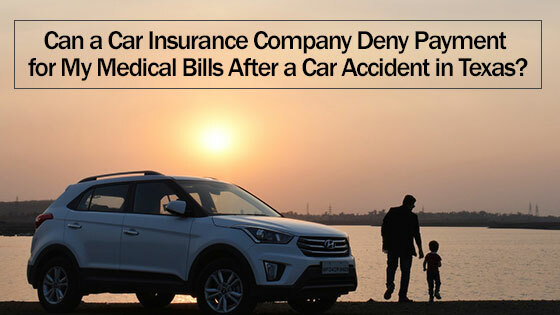 Home » Blog » Can a Car Insurance Company Deny Payment for My Medical Bills After a Car Accident in Texas? A Car Accident Attorney Explains. Can a Car Insurance Company Deny Payment for My Medical Bills After a Car Accident in Texas? A Car Accident Attorney Explains. Car insurance covers property damage and liability. However, it is important to note that insurance companies do not handle injury claims the same way that they handle property claims. Many people hire a car accident attorney because they do not get fair compensation from their insurance company. Most people who file an insurance claim for property damage find that it is an easy process. Unfortunately, it can be a lot more difficult to get compensation for a personal injury claim. Insurance agents may act friendly. They may even seem as though they have your best interest at heart. However, they are working against you. The insurance company is there to work against you because they are focused on profit. Their goal is to deny your claim or at minimum dramatically reduce it. Thousands of people deal with difficult insurance companies on a daily basis and the main recourse that they have is to hire an experienced car accident attorney who can fight for their rights. Liability insurance is designed to cover property damage and bodily injury that occurs in an accident. It is important to note that insurance companies are not obligated to pay for medical bills or any other damages unless you agree with the insurance company settlement amount or unless a court orders their insurer to pay you damages. If you and the insurance company cannot agree on the settlement, then the case will have to go to trial. If a case goes to trial, then a jury will typically decide the amount of damages that will be awarded to you, if any. If you are interested in maximizing this settlement, then hiring an attorney is the best way to do this. They will have the knowledge and experience to deal with these difficult insurance companies. If I Win My Case, Then Does The Jury Have to Award Me the Medical Bills? If you go to trial, then your attorney will have to prove that the medical bills were caused by the negligence of the other driver. They also have to prove that the amount that they are asking for is reasonable. You may not be awarded damages if your own negligence contributed to the accident. You can still be awarded damages if your own negligence caused the accidents. However, the amount that they give you may be reduced. A jury is not obligated to award you the full amount that you are asking for, and the insurance company may argue that they do not have to give you anything. They may also argue you that your negligence caused the accident, or that the doctor overcharged you for the services. This is why it is imperative to have an experienced car accident attorney on your side to guide you through this difficult and complex process. Do I Have to Accept What the Insurance Company Offers? If the insurance company is not giving you a fair settlement, then you have a right to reject it. But how do you know what is a fair settlement? These are the details that a car accident attorney can assist you with. Are Insurance Companies Obligated to Act in Good Faith? If you are dealing with your own insurance company then they are required to act in good faith because they have a contract with you. However, often if you are the victim, then you will have to deal with insurance company of the individual who is at fault. Their insurance company is not obligated to act in good faith towards you because you do not have a contract with them. Some insurance companies will attempt to settle with you. However, they do have a right to dispute your claim. You do not want to go through this ordeal alone. We advise that you contact a car accident attorney at the Law Offices of David Kohm for a free consultation.